...the government component fell a hefty 53,000, so private payrolls were down 210,000, not statistically different from August’s -182,000 but better than previous months. The fact that government employment fell -- largely because of declines on state and local levels -- isn't exactly good news, but it also suggests that the chances of a W-shaped recovery haven't increased. Though it retreated a bit last month, the blue line is up significantly from its trough earlier this year and has generally been creeping up toward the lows of the two previous recessions. 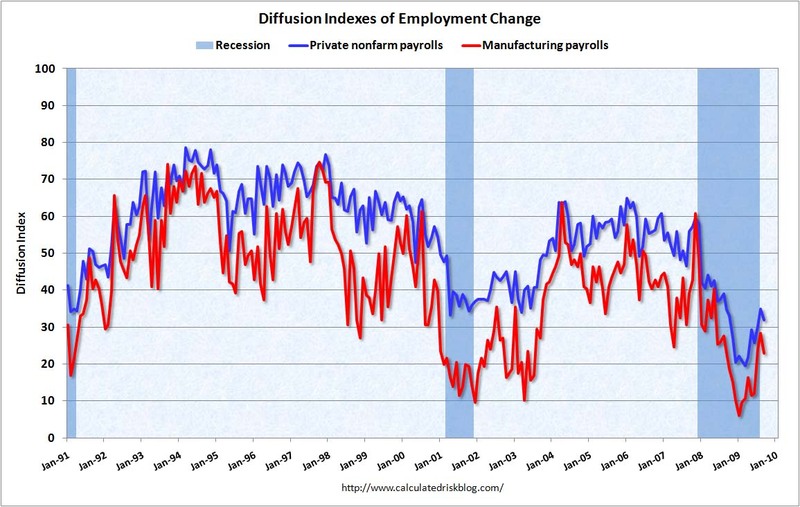 So perhaps we're entering a more "normal" phase of the jobless recovery. Unfortunately, if the last two expansions are a guide, a more normal phase could mean it'll take at least one year, if not two, to get back to job growth.